Fr. Aloysius now "Servant of God"
Fr. Aloysius officially called "Servant of God". Just a brief note regarding the above picture. I'm pictured in front of the offices of the Congregation of Saints in Rome, right outside of St. Peter's basilica on Thursday, June 12th. I had just visited St. Peters and walked through the Holy Door to gain the "plenary indulgence" of the Holy Year. The Holy Year of Mercy was proclaimed by Pope Francis and lasts from December 8, 2015 to November 20, 2016. 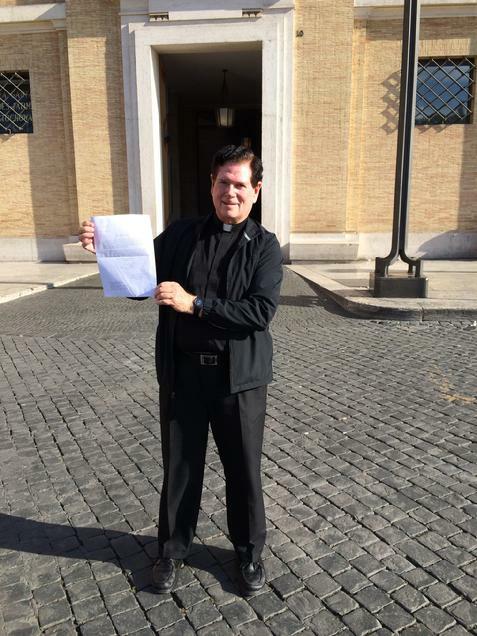 Among other things, the Nihil Obstat issued by the Congregation of Saints, besides giving Archbishop Jose Gomez the assurance there is nothing in Vatican files to stand in the way of a cause of sainthood for Fr. Aloysius Ellacuria, CMF, this letter issued April 11, 2016, refers to Fr. Aloysius as "the Servant of God." Wow! This is the offical statement by the Church that Fr. Aloysius cause is moving forward, and that we can refer to him as "Servant of God." What a great blessing during this Holy Year of Mercy!